Feel welcome to look at my CV, as well as my thoughts on teaching and research. (Not surprisingly, as a philosopher I have views on most things.) I have also included a general version of my diversity statement. 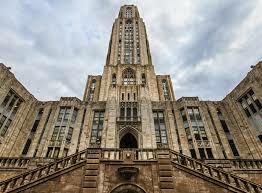 Pitt's Cathedral of Learning. A building--I work here. I am currently an instructor in History and Philosophy of Science at the University of Pittsburgh. The majority of my work has focused on advancing our understanding of understanding (and explanation). I've also branched out some into the realms of transformative experience and a bit of value theory. After years of teaching bioethics, I'm finally a full-fledged researcher of bioethics and philosophy of disability--I think these connect to philosophy of science in interesting ways. Learning of Cathedral. A book--I read here. Cathedral of Notre Dame. Another building--I have no connection to this one, but really enjoyed Victor Hugo. Ohio State philosophy prides itself on graduate student teaching, and so I have experience teaching my own classes. I have also been entrusted with classes here at the University of Pittsburgh. (I'm currently at 30 classes taught as instructor of record.) Getting students to love philosophy is almost certainly the best part of my job. I think it's important to me that we as teachers bring opportunities to love philosophy to as many varied groups as we can. This suggests the need for a plan of active engagement and mentoring. The band "Cathedral". I actually have no idea who these people are, but hate to let a good theme die.